There have been 33 Jushoku of 長妙山 圓教寺 Chomyozan Enkyoji Buddhist Temple of Saga in our Lineage since 1555. Kanjin Cederman Shonin was born in Wheatfield, NY. When he was 18, he became a Buddhist monk in the Chinese Shingon tradition. At the age of 23 he moved to Toronto where he met Tsukamoto Shonin, head minister of the Toronto Nichiren Shu temple. Tsukamoto Shonin gave Cederman Shonin a copy of the Lotus Sutra. Then Shami Cederman became convinced that the Lotus Sutra was the highest teaching of the Buddha. One week before he was scheduled to move to Taiwan for the rest of his life, Shami Cederman left the Shingon temple and began to study with Kanto Tsukamoto Shonin. 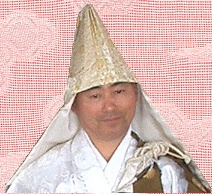 Kanjin Shonin studied with Rev Tsukamoto for 13 years. 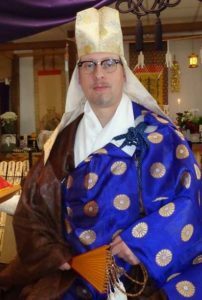 In 2007 Rev Cederman attended Shingyo Dojo at Mount Minobu in Japan where he completed his studies and became a Nichiren Shu priest. In June 2010 he attended reidan training in Tokyo, and in November 2010 he attended Aragyo at Onjuin in Chiba, Japan. 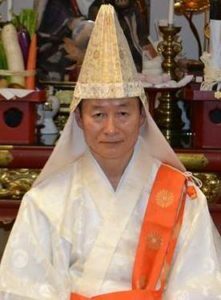 Kanjin Shonin is Abbot and head priest of 長栄山円教寺 Choeizan Enkyoji Temple of Seattle and 祥栄山円教寺 Shoeizan Enkyoji Buddhist Temple of Rochester and the 円教寺 Enkyoji Network of Nichiren Shu Buddhist Temples and Sangha World Wide.